While these two historic towns have their roots in agriculture, visitors will discover much more today. Greeley has fascinating museums and was recently named a Certified Colorado Creative District, and Loveland is one of the most vibrant arts communities in the nation. Like any good college town, Greeley has a colorful selection of coffee shops, serving residents and University of Northern Colorado students. Get your fix at spacious Zoe's Cafe before hitting the streets, where, as part of a Historical Preservation Commission walking tours and Brown Bag Series, you’ll learn about the city’s neighborhoods, historic sites and architecture. Greeley’s museums offer glimpses into the lives of the town’s celebrated historical characters, such as Rattlesnake Kate, who hunted 140 rattlesnakes and then sewed a rattlesnake-skin outfit, complete with headband and shoes. See the strangely fascinating rattlesnake dress at the Greeley History Museum. 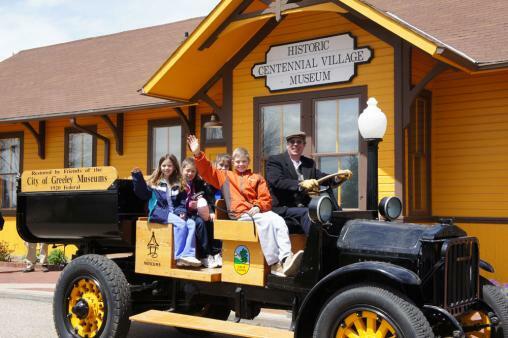 Peek into the lives of more average settlement-era citizens at the Centennial Village Museum, an eight-acre outdoor living history museum with more than 30 vintage homes and structures. Get friendly with cowboys and miniature farm animals in the interactive atmosphere. Nearby, railroad buffs can marvel at more than 600 railroad artifacts, 20 scale miles of track and hundreds of miniature buildings at the Colorado Model Railroad Museum at Greeley Freight Station. Throughout your visit, you’ll find more than 50 pieces of public art sprinkled around Greeley, as well as lovely parks that feature lakes, small streams, bridges, waterfalls and islands. Newly opened Homestead Park and Open Space has walking paths, a playground and public art, including artist Joshua Wiener’s Rain Symphony sculpture inspired by the city’s sophisticated water system. Or take a swing along the Poudre Learning Center along the Poudre River Trial, with beautiful views, easy hiking trails and access to the Cache la Poudre, catch-and-release fishing and wildlife viewing. The center has a system of barrier-free, wheelchair-accessible pathways and learning areas. Point your compass west to Loveland, a community committed to the arts. Spend time at Benson Sculpture Garden, featuring 139 sculptures. The park’s annual shows are two of the largest outdoor art exhibitions in North America. Head downtown, where charming blocks showcase historic buildings, shops and restaurants, and the beautiful art the city is known for. Visit the Loveland Museum and Gallery to see all of the stamps used in the Loveland Valentine Re-Mailing Program; stop by the famous Post Office from where all of those love letters are forwarded, an Art-Moderne style edifice built in 1937. At Your Pace has recently launched two perfect ways to explore Loveland: Bike & Brews and Art by Bike are two tours that lead you to the city’s highlights. Or, stop by the Loveland Visitor Center to pick up the Passport to Love • Beer • Culture. Fill your passport up with enough stamps and you’ll get a free T-shirt or pint glass. For a fitting end to the day, admire Mother Nature’s contribution to the town’s public art program: The splendor of the sun setting over Lake Loveland, right in the middle of town. Or head back to Greeley for a night of food, cocktails and first-run and indie movies at the all-in-one Kress Cinema & Lounge. Another option is Sylvan Dale Guest Ranch’s dinner horseback rides (or anytime rides! ), which come with a trek to beautiful to Eagle Ridge. Or, back in Greeley, every summer Friday brings live music on the 9th Street Plaza, with street performers, fire spinners, face painting, balloon artistry, sidewalk chalk and more.